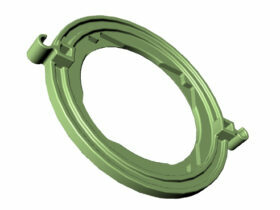 The ring offers a perfect fixation and alignment of the holder and fits on every type of housing of roentgen tube. The double spacing for the holders including the cable clips offers a good fixation of the holder and cable. To protect the sensor cable the positioning ring is equipped with cable guides. No changing between different rings for specific images, 1 ring fits all. phosphor plate holder "The Clip"